Between working, exercising and spending time with family, you may think you’re giving yourself enough breaks, but what about during work? Taking breaks throughout your work day is vital to maximizing productivity. Think you don’t have time? Even a 30-second break can account for an increase in productivity. There are different strategies for a work-break balance too, and it’s important to find the one that is best for you. For example, try out a 25/5-minute split -- that means work in 25-minute blocks and take five-minute breaks between. If that doesn’t work for you, there’s also 50/10 minute split. 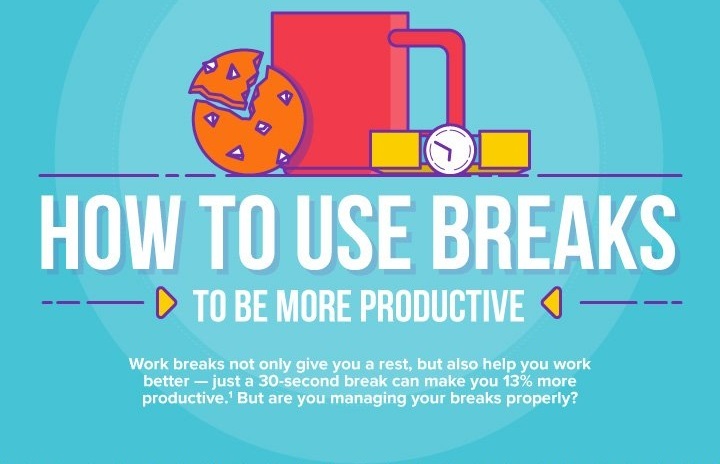 To learn how you can start taking breaks and maximize your time, check out Quid Corner’s infographic below.